While there’s nothing wrong with enjoying great beer in a drab taproom or a dingy dive, there’s something to be said for drinking exceptional craft brews in jaw-dropping settings. That’s why we searched coast to coast for taprooms, bars, and restaurants with more views than Drake’s last album, and paired them all with one fantastic local beer. Hit up these eleven spectacular settings from Brooklyn to Hawaii and we guarantee the beer won’t be the only memorable thing about your visit. Anyone who tries to drink a high IBU hop bomb in a humid, swampy climate like New Orleans is a fool. That type of weather demands a beer like Abita’s citrusy session IPA named after America’s favorite party city. And while being squeezed into a tiny bar in the French Quarter with scads of other sweaty tourists can be a good time, it’s also nice to stretch out and have an Abita or two at a restaurant like The Blue Crab. Situated on a dock on Lake Pontchartrain, this spacious seafood spot has all the catfish and oysters you demand on a trip to NOLA, along with a picturesque place to park your boat. If you don’t pull up in a boat, at least you’ll have a nice place to sit and enjoy a beer while staring at someone else’s. Finding fresh, local seafood on The Big Island is as easy as finding a cheesesteak in Philly. Finding it paired with beer this good and ocean views this stunning is another story. And while the prices at this eatery located in the massive Hilton resort complex aren’t cheap… did we mention those views? Show up as the sun is setting, and nature will put on a free light show as you sip on Kona’s tropical fruit flavor-filled Hanalei. The beer lacks the hoppiness you might expect in something labeled an IPA, but when the Hawaiian breeze is flowing through your hair, and the passionfruit, orange, and guava notes hit your tongue, you won’t care. If you do find yourself caring, we recommend ordering another round and soaking in more of that aloha spirit. Northern TerritoryYou can see four of the five boroughs from the top of Northern Territory. Oh, and have some great beer. An Aussie bar with stunning views of Manhattan, NoTe’s beer list features selections from Tasmania (James Boag) and Adelaide (Coopers). But since this is a story about places you should drink local brews, we recommend sticking with Sixpoint’s Brooklyn-made favorites. You wouldn’t be wrong to order the cream ale Sweet Action on tap, but the move here is the Resin, a 9.1% double IPA loaded with hops (and, not surprisingly, 103 IBUs). Since you’d be silly to not appreciate some of the Aussie flair while you’re there, pair the Sixpoint with an authentic Aussie beef burger. Heads up: that means it’ll have a beet on it. For real. What the heck are they drinking in Australia? Other than James Boag and Coopers. 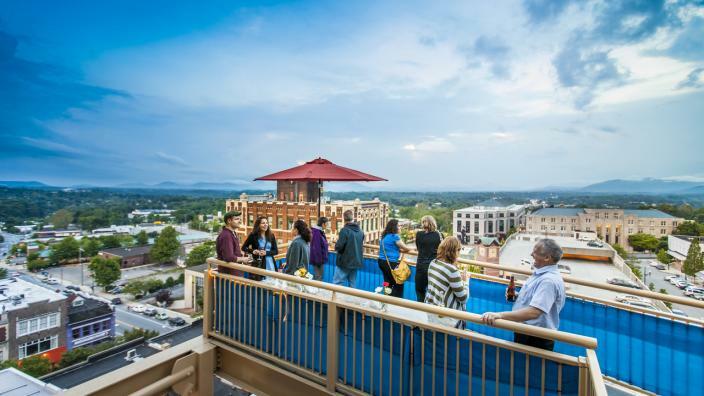 It’d be tough to find a better view in Asheville than this one, as it offers the perfect setting to see the sunset, mountain vistas, and a bird’s eye view of downtown. The only thing you need to make the view even better is a damn good Asheville beer in your hand. And maybe a million dollars. That’d be nice too. But we digress. While breweries like Hi-Wire, Burial, and Wicked Weed might be the latest spotlight stealers in a city full of seriously good beer (and apparently the third most breweries per capita), we recommend cracking open a brew from one the OG breweries on the scene: Green Man. If it’s a cold night, rest assured the porter’s chocolate, malty notes will do its best to warm you up. 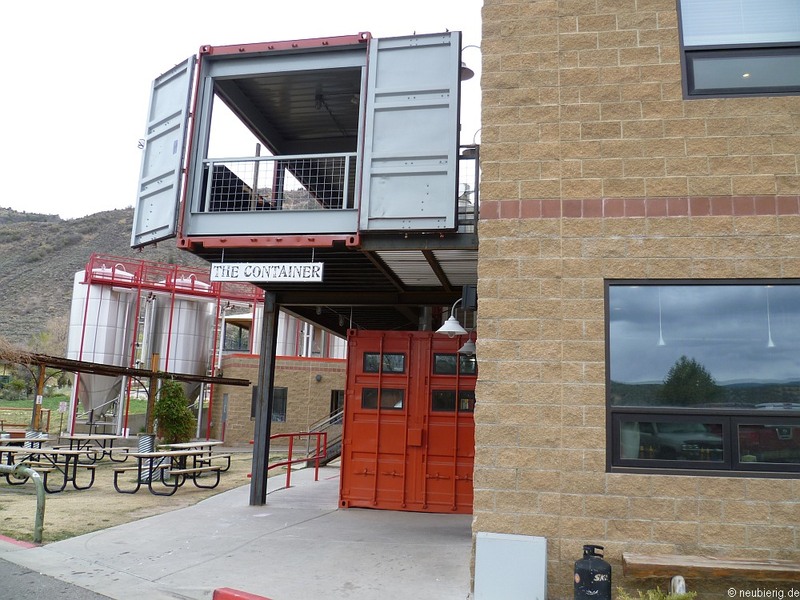 Plenty of Denver rooftop bars offer mountain views and a variety of Colorado craft beers. But the difference between looking at the mountains and being in the mountains is significant. Beer ParkAn adult playground, in the middle of an adult playground. The Bellagio fountain made famous by Ocean’s 11 and a million tourist photos is also the backdrop for your drinking adventures at the first rooftop beer garden on the Strip. The beery paradise is located in the Paris Las Vegas hotel, and it’s not tiny – the deck has 10,000 sqft of places to drink, play beer pong, and race tricycles before playing more beer pong. Since it’s got Budweiser’s branding all over it, there’s plenty of Bud-affiliated breweries on tap. But this rundown is about local brews, so we’ll recommend a can of pale ale from Joseph James in Henderson. Its Citra Rye is a balanced beer that doesn’t go overboard on the hops – making it a solid, middle-of-the-road beer choice in a city full of excess. Finding a good beer at a drinking establishment with a view shouldn’t be difficult in Miami considering how photogenic the city is, but you’re more likely to find $500 bottles of tequila than a good craft beer. It’s a shame, especially with solid breweries like M.I.A. and J. Wakefield close by. But luckily M.I.A. and a rotating selection of local beers is poured at Sharkey’s in the Bayside Marketplace, serving as a needed oasis in a space full of chain options. Grab the cleverly named Miami Weiss, a hefewizen with the requisite clove and banana flavors, and admire the yachts of the superrich in the Biscayne Bay. But seriously, the beer’s name is Miami Weiss and it has a spot-on art deco-inspired can. It’s just too clever. You’ll be excused if you smirk at the label every time you pick up the beer. C’mon, do we even need to sell you on the promise of eating freshly caught seafood while drinking Allagash White brewed 20 minutes away? Well, here’s one more unnecessary selling point anyways: the restaurant’s on the Portland waterfront. And as you might guess from its name, serves up award-winning lobster rolls. The only downside is that it’s not open year-round, but the eatery’s seasonality will make that lobster roll taste even better when paired with the classic Belgian-style wheat. The beer has won more awards than Meryl Streep (ok, probably not that many), and that’s clearly due to its sessionable, summery quality. Jester KingNot every view comes from way up high. There’ve been plenty of ocean views in this rundown thus far, but there’s something to be said for enjoying a pint or two in the bucolic countryside. While many modern-day breweries are tucked in the back of industrial parks, Jester King transports you to another place altogether with its rows of outdoor picnic tables with umbrellas in case the trees don’t provide enough shade. And we’d be remiss if we didn’t point out that experiencing Hill Country on Jester King’s 58 acre farm is elevated by the presence of its unique, barrel-aged beers. After all, this year’s Estival Dichotomous features grapefruit, tangelo zest, and Marion blackberries. You could likely enjoy beer this good if you were stuck inside a windowless room, but it’s not a stretch to say that drinking it in the great Texas outdoors makes every sip a little bit sweeter. Anchor Steam is as much a part of San Francisco’s history as earthquakes and Giants World Series wins. After all, it’s been around since 1896, largely due to its balanced, smooth quality that hasn’t gone out of style in a world of fruity IPAs. It’s therefore a logical choice to enjoy one at Top of the Mark, a bar on the 19th floor of the Intercontinental Mark Hopkins Hotel. Get there early enough to catch both the Golden Gate Bridge and a stunning sunset. But rest assured no matter if you go on a clear, beautiful day or a foggy, rainy one, Anchor Steam will be there. And like Jack Torrance at the Overlook, the beer always will be. But, you know, in a much less creepy way. 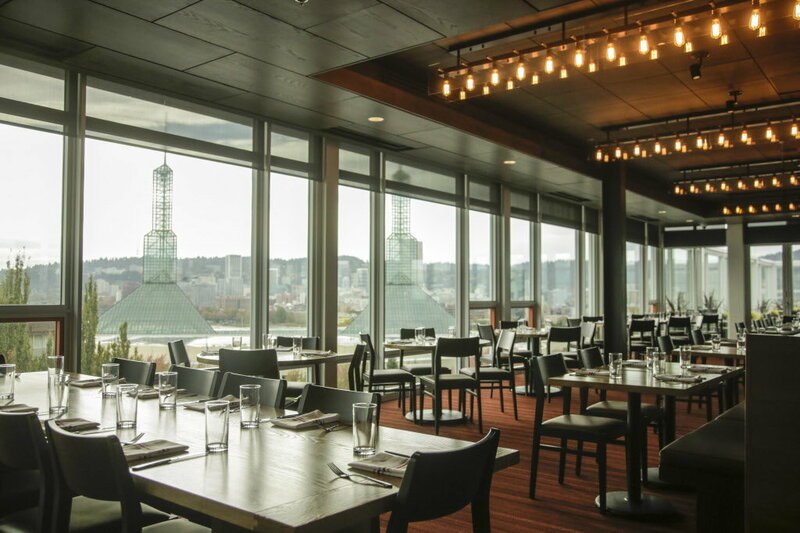 You can’t go wrong with any of the 16 Oregon-focused taps available at Altabira’s rooftop patio, a Pacific Northwest beer lover’s paradise situated inside the Lloyd Hotel. But since this is Portland, unless you’re visiting in those magical two months per year without precipitation, you’ll probably be inside. No matter. We guess you’ll be happy with the selection of beer, which currently features breweries like pFriem and Double Mountain. But we’d steer you in the direction of Phaedrus, as you might as well enjoy a beer brewed with Citra and Mosaic hops. When in hop country, do as the Oregonians do. That’s the phrase, right?